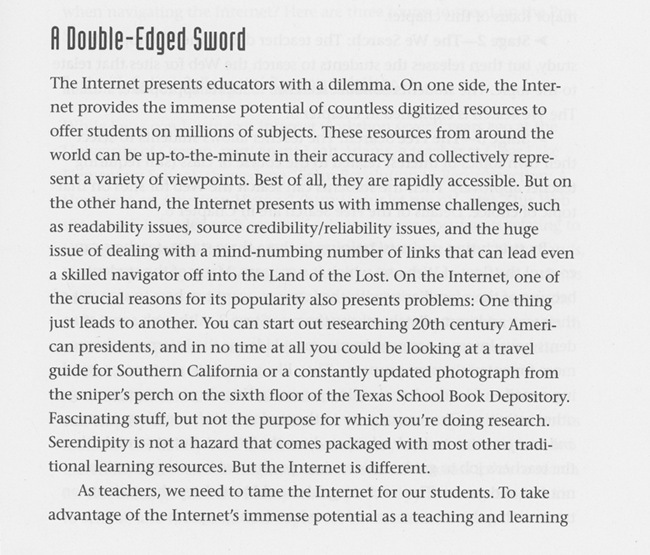 I love this idea of serendipity as a hazard of the internet, and one which distracts us from the point of….learning? It’s a truly bizarre idea, but at the same time it also fasicinates me. The idea of blazing pathways across resources, disciplines, cultures, etc., through hypertext is seen here as one of the real limits of the web for education. And the money quote for me, “as teachers, we need to tame the internet for our students.” I can’t help but think this is still part of the mindset when it comes to the siloed learning management systems that are pervasive in education. The open web is just too confusing and messy when it comes to teaching, we need stay down in the lead-reinforced walls of the LMS bunker until this fad passes 🙂 Duck and cover! But that’s not all, the next page has a solution! “condense the possibilities for our students” and “structure the experience for their success.” The idea of the web as a network, even thirteen short years ago, was seemingly unfathomable in education. And while I would like to applaud the idea of training students how to use the web for research, it’s remarkable how dominated the language in this book is with verbs like “control,” “manage,” and “tame,” as if it were even possible. 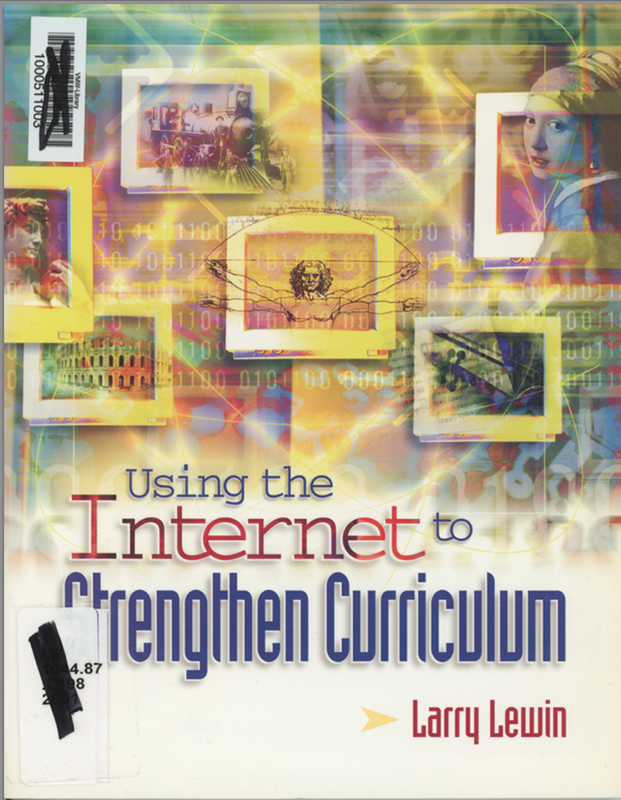 I can’t help but think that during the decade since this book was published, framed by the explosion of Web 2.0, schools and universities moved away from trying to control the web—given the futility of such an enterprise—and simply refused to enagage it as part of the curriculum. Faced with the impossibility of control, there was a fear-driven retreat to the bunker. If you didn’t like this post blame Ben Rimes because his comment here gave me the idea for it. This entry was posted in Instructional Technology, The Internet Course and tagged edtech, fun, instructional technology, tic104. Bookmark the permalink. Wow. I really want to go find more writing on this topic from this timeframe. Fascinating stuff. I guess it is somewhat what naturally follows if you view the internet as some sort of giant library, a place to go to find and collect information, not a place to find and connect with other people. The first page could pretty much serve as the design document for Wikipedia, and illustrated why it’s such a divisive tool when you talk with educators; some laud the huge repository of information, while others focus solely on the questionable authenticity of its editors. I see the words control, manage, and tame as being slightly more mainstream synonyms for the same thing that drew me into #ds106 and other social spaces on the web. We’re all trying to create an understanding of the various resources and connections the web provides us. In building communities, even with #ds106, we’re building a modern version of the “we search” and the “free search”. We’ve been assigned a topic by our instructor, and we’re curating a selection of resources, tools, and relationships to help us accomplish assignments. In some ways, the “pre-search” already exists in that the #ds106 site hold curated lists of tools, blog posts, and other “entry points” into the world of digital storytelling. We could ignore individuals insistence to “tame” the web, but we do it every single day, for both ourselves, and those we work with. We might call it something else, and we might attempt to control our connections and pathways to varying degrees, but when you wrestle with the basic fundamentals of building knowledge, I’m not sure there’s a way to do it without avoiding placing concepts into some sort of box, to then examine and carefully consider. What I think you’re getting at, is the general lack of teachers moving passed the modeling of “managing” the internet for their students, and passing the duties of managing that work flow for themselves. I often see many teachers doing a wonderful job of modeling ways in which they attempt to make sense of the web, but neglect to help students explore, co-opt, and develop their own methods for “taming” the web. Instead, due to any number of issues (time, curriculum, resources, etc.) they simply create a standard toolset for learners, and then hand it over to them, rather than helping learners build their own toolbox, and allow them to self select which tools to fill it with. And please, feel free to blame me more often for posts like this! First, thanks for the inspiration. Second, I think your last paragraph gets at exactly what I’m trying to say. Most schools didn’t interrogate the next steps of taming the web as a transition to empowerment with this new platform, and that happened for a variety of reasons. In psots liek this abou the history of edtech I’m trying to avoid blame and golden agism. I’m not always successful, but I knwo that’s my goal. I want to look at broader cultural moves we all on some ways were driven by. I would have not found this book so crazy fifteen years ago, and that’s telling. Hindsight is the best friend of a critic, I want to try and understand the how and why—not so much the who. As for the what and when, they are moving targets. In fact, they all are, which pisses me off.